“These two late 1980s Ghanaian highlife cuts are taken from the catalogue of Nakasi Records. Nakasi was run by the late producer Nana Asiedu (Big Joe) - a well-known figure in the Ghanaian and African music community of 1980s London. 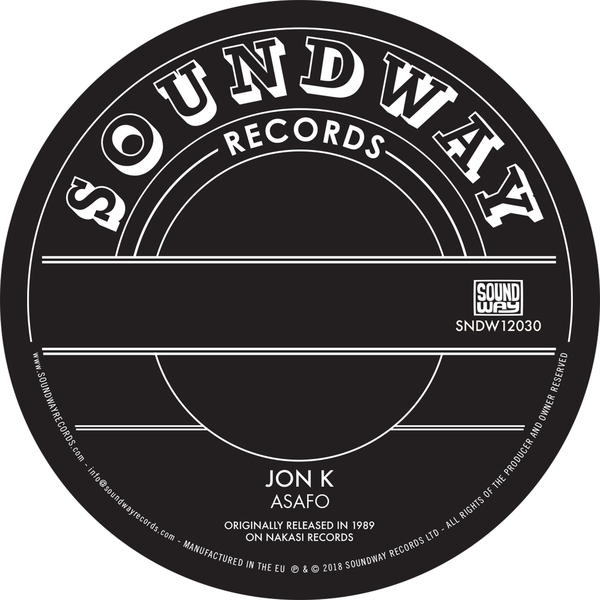 The A-side showcases a track from Jon K's second solo album, which was a re-working of a traditional Fanti language Asafo company song Asafo Beesuon. Made famous by C.K.Mann on his seminal album ‘Funky Highlife’, this version very much reflects the more westernised late 1980s sound of highlife music recorded in the UK, Holland, Canada and Germany for both ex-pat Ghanaian audiences and those back home in West Africa. The album features the stalwart session musician Alfred Bannerman, the go-to Ghanaian guitarist known for the classic cut of ‘Let Me Love You’ by Bunny Mack, among many other tracks over the last 40 years, including his work on contemporary releases for Soundway such as Konkoma and Ibibio Sound Machine.